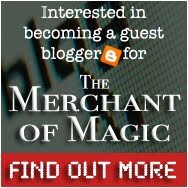 Interested in Guest Blogging at The Merchant of Magic? Great! We are always looking for quality blog contributions for The Merchant of Magic. The aim of the Merchant of Magic Blog is to help magicians improve their magic practice, performance, and to gain the motivation and confidence to go out an perform their magic. The blog isn’t run as a commercial for the magic shop. It’s a way of paying back the magic community for supporting the merchant of magic and helping it grow. We would love to receive some articles or posts from you,that would help your fellow magicians. Your post must be on one of these topics: Learning Magic, practice strategies, marketing for magicians, Showmanship for magicians, and performing advice. The post can’t include any exposure of a magic tricks methods. It should be original and not previously published either on the Web or in print. It cannot be an advertisement for your services or products. You agree not to publish it anywhere else, including your own blog or Web site. You may include byline links for your blog or performing web site (not general magic shop websites), your bio or About page, and your Twitter username. Your post should be 300-800 words. Interested?